I’ve blogged quite a bit about various curio stores in old Shanghai and Peking run by foreigners (Hoggard-Sigler, Jean Lindsay, Western Arts Gallery in Shanghai and The Golden Dragon, and of course The Camel Bell in Peking). 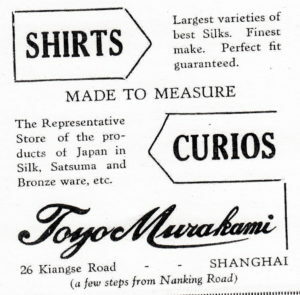 Here though, from the 1930s is a Japanese run curio store in Shanghai – at 270 Kiangse Road (now Jiangxi Road) at the corner with Ezra Road (Shashi No.2 Road) – that also sold silk shirts. Most of their curios appear to be Japanese – Satsuma etc – though they also sold Chinese curios. I’m afraid I know very little about the shop except that it was run by Mr Toyo Murakami. I have no more leads on the store or the owner – sadly I don’t read Japanese and Toyo Murakami appears to be a very common name and so you can’t pin any of the leads down.